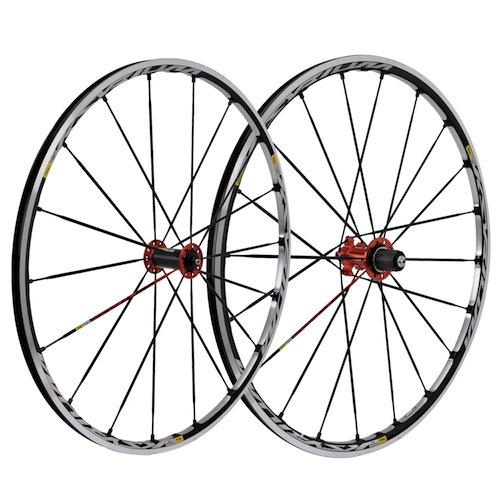 These wheels have become enormously popular amongst the cyclist crowd, which can be explained by the fact that they provide users with incredible performance, yet can be bought at a reasonable price. Users will be impressed with the bladed Zicral alloy spokes, which provides an indomitable blend of durability and lightness, alongside aerodynamics. In addition to this advantage, you get many others with the Ksyrium wheelset, including Mavic’s UB Control and SUP rim treatments and this is excellent because it means that the braking surface and the welded rims have been machined to perfection, so the performance that you get from the wheels will be extremely reliable and consistent on a daily basis. The SL Wheelset’s front rim measures in at only 22 mm deep, which results in it being a lot lighter than you might expect and this gives the Wheelset the resulting advantage of being more stable in cross winds and when descending at high speeds. The rear rim on the Ksyrium SL is slightly deeper, at 25 mm, which results in the rim being a bit firmer and having more resistance to flex, which Mavic state produces ‘superior power transfer’. The rim weight has also been minimized due to the Ksyrium SL Wheels getting Mavic’s distinct treatment of ISM milling of the rim between spokes. Mavic have used carbon fiber shells and aluminium flanges in their construction of the Ksyrium SL’s oversized hubs, a design which has achieved its aim of reducing the total weight of the wheels. Along with having QRM+ bearings, the wheels have been double-sealed for durability and each of the hubs also allows for micro-fine preload adjustment for precise bearing. Whilst the wheel at the front numbers 18 radially laced spokes, the wheel at the rear has 20 and incorporates Mavic’s Isopulse spoking pattern, which aims to provide users with optimum power transfer. The Wheels also contain a Zicral spoke-specific wheel magnet, bearing adjustment tool, as well as a truing wrench and you can also find those that are available with a Campagnolo-specific, or a Shimano/SRAM-specific free hub body. The Ksyrium SL Wheelset comes with the offer of the MP3 (Mavic Product Protection Plan) extended warranty program, which will provide you with two years of just about unlimited no-fault protection, however, you will need to purchase this within 5 days of buying the wheels. The Ksyrium SL Wheelset is more than capable of impressing those who want to race or train all year round, so are a very sound investment for any keen cyclist to make.